This entry was posted in Ethel by Dennis Danvers. Bookmark the permalink. Only one ear up? Was she indifferent to the experience? While I have caught glimpses of occasional left ear elevation, we’re talking tap-dancing squirrels level stimulation. 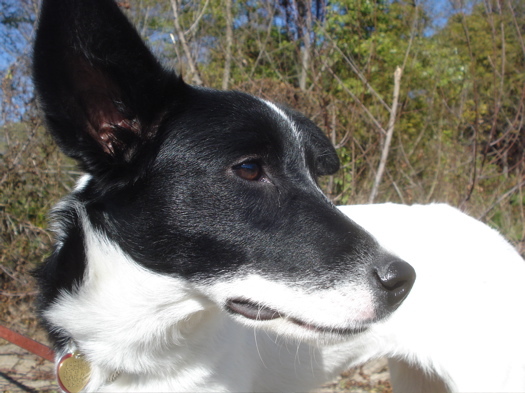 The right ear droops when faced with great perplexity, but is usually perkily upright. I’m still sorting out the complex semaphore of more subtle emotions. She thought Belle Isle rocked. Though Pony Pasture may be her fave. She looks very in her element. Is she a water dog or was it too cold? She likes to play in the water. No swimming yet. We saw some labs fetching from the river, and she was rapt. When the river’s warm enough, I’m hoping she’ll swim with us. Dennis: Great looking dog. Hope you guys are doing well these days. I’m encouraging her to go into advertising so somebody can make some real money around here. Maybe do one of those drug commercials. Can’t you see her bounding around while someone recites the side effects?